Providing all clients with reliable, professional and innovative systems integration solutions through friendly and personalized service. Contributing to the technological development of Qatar and the Middle East, by introducing innovative systems solutions. Total commitment on every project. Exceeding our client’s expectations in quality and service. Training and further developing our team of experts. Our vision is to be the first choice for integrated, low-current systems solutions in the Middle East. Techno Q is dedicated to exceeding customer expectations in quality and service through continuous improvement and customer interaction. 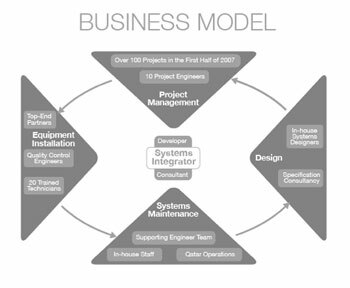 Our objective is to achieve the highest quality with custom engineering and system integration. We pledge our commitment to excellence in every aspect of our organization. Whatever the project, our commitment is total. Our planning and project management meets the highest international standards, marrying innovative design with product selection from the world’s leading manufacturers. What sets Techno Q apart is our commitment to exceeding our customers’ expectations in quality and service. Our international team of highly skilled and dedicated employees ensures that each and every project receives exceptional service during and after project completion. We make every effort to understand our clients’ project requirements, from their day to day operations through to their strategic project goals. Our aim is to always deliver the right solutions that exactly fit the need, offering value for money while keeping our clients well informed at every stage of a project cycle.